The JASC Liquid Fuel Check Valve improves fuel system reliability on dual fuel turbine engines. JASC’s high-flow, zero-leak Liquid Fuel Check Valve is designed to operate with fluids including Stoddard solvent, jet fuels, hydraulic oil, synthetic oil and air. This check valve utilizes fluid dampening to provide stable valve operation from crack to full flow operation. The inverted spool within the JASC Liquid Fuel Check valve makes use of a Helmholtz Resonator, which dampens the effect of fuel pressure imbalances, providing greater operation stability than a traditional ball and spring liquid fuel check valve. The inverted spool meters fuel and holds a specific delta pressure across the valve, allowing the valves to open uniformly and simultaneously. To ensure the Liquid Fuel Check Valves meet the customer’s unique performance specifications, JASC rigorously tests each valve. The check valves are contamination tolerant, chatter resistant, and have a ANSI Class 6 zero-leak seal in the check direction. This valve can be refurbished indefinitely, returning the valve to its original operating condition. This lowers total cost of ownership significantly over liquid fuel check valves that can’t be refurbished. 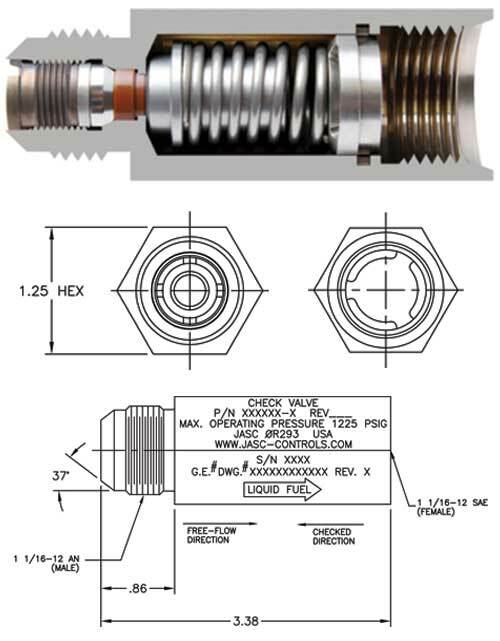 If you’d like to view JASC’s Liquid Fuel Check Valve technical drawings, you can request them here. 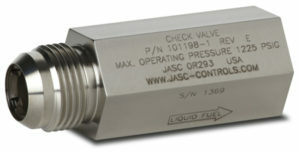 Learn more about JASC’s Liquid Fuel Check Valve.